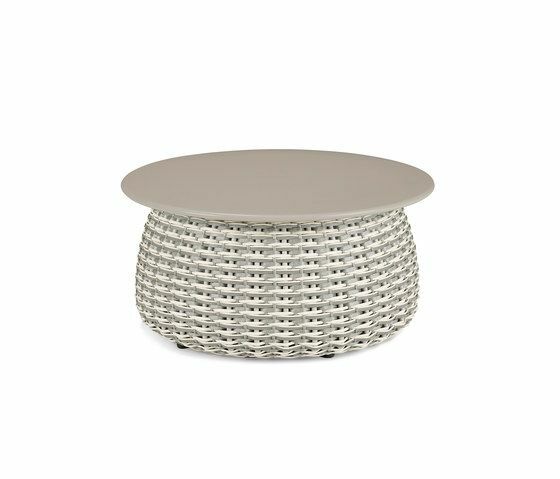 ARTFULNESS MEETS PRACTICALITY IN A UNIQUE COLLECTION OF SCULPTURAL SIDE TABLES The right accessory can bring a new dimension to any outdoor living room, adding a subtle twist, enriching the material mix and helping to complete the overall atmosphere. But what exactly is the right accessory? It has to be beautiful, of course. It has to be interesting. And it ought to be unexpected. In other words, the right accessory for almost any outdoor setting is PORCINI, by Lorenza Bozzoli. Named after the beloved Italian mushrooms it casually resembles, PORCINI is a collection of sculptural side tables as practical and versatile as it is delightful to the eye. Available in three heights, two different base styles and two elegant colorways, the side tables integrate with any DEDON collection and make the strongest impression when displayed together in a mix of shapes and sizes. All versions of PORCINI come with a tabletop of rich, smooth, scratch-proof, shock-resistant ceramic in a choice of Black or Taupe. The woven base, available for all three heights, comes in dark Marrone (for the Black top) or lighter Carrara (for the Taupe top). The all-ceramic base, available only in the short and medium heights, also comes in a choice of Marrone or Carrara. While the all-ceramic version shows off PORCINI’s organic, sculptural form to full effect, the woven version presents an eye-catching mix of colors, materials and textures. In addition to DEDON Fiber, the masterful weave incorporates ropes of carefully selected, tone-on-tone and shiny yarns, woven in Italy exclusively for DEDON by one of the world’s leading traditional marine-rope weavers. As artful and irresistibly charming as they may be, the PORCINI sides tables are also useful, offering sturdy tabletop-space at a variety of heights. The short, squat version even features its a hidden basket, perfect for storing towels or protecting personal items from direct sunlight. So what are you waiting for? Plant PORCINI and bring a whole new dimension to your outdoor living room.